Since the events at Stoneman Douglas High School in Parkland Florida on February 14, 2018, has anyone else been wondering if we are living in an alternate reality? I hear arguments from people (people whom I used to think were rational), claiming that teachers need to be armed. I’ve seen ads for bulletproof, pod-like structures for classrooms. I’ve read about school districts arming their teachers and students with miniature baseball bats. Is this where we are? This is our reality? I watch the news and it’s easy to understand why there is a teacher shortage in this country. We need more funding. We need better supplies. We need more pay. We are underpaid, overworked, and now we are expected to attack an armed intruder with a miniature baseball bat, all for a measly $38,000 dollars a year? You must be crazy to want to go into education right now. When I find myself feeling hopeless and discouraged with my choice of a career, I find inspiration in the students from Stoneman Douglas High School. 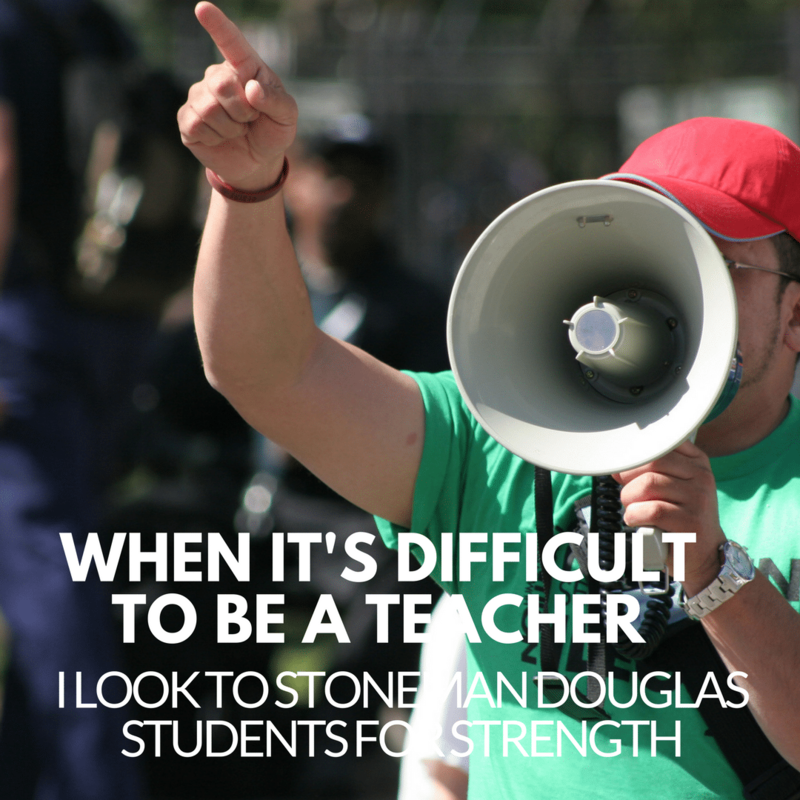 I see students who are the direct results of having hard-working, dedicated, strong, fearless teachers in their lives. These students remind me that what I do, does, in fact, make a difference. I am inspired by these students because they are courageous. Click To TweetI am inspired by these students because they are courageous. A few days after 17 of their classmates were killed and more were wounded, survivors Emma Gonzalez and David Hogg went on national television in front of millions of viewers and held it together long enough to demand change. On February 17, just days after the shooting, Emma Gonzalez gave her now infamous “We call BS” speech, where she called out lawmakers and the lack of gun control laws and called on young people to register to vote. I don’t think I would have been able to pull myself off the floor of the storage closet where I was hiding, much less give such a passionate speech that has since been viewed hundreds of thousands of times. I am inspired by these students because when others go low, they go high. Since this shooting, not only have these students received numerous death threats, but they’ve witnessed full grown adults spread lies and conspiracy theories about them. There were doctored photos of Emma tearing up the constitution all over the internet, and rumors that David Hogg was an actor. Fox News host Laura Ingraham mocked David Hogg’s college rejections on Twitter. Benjamin Kelly, Aide to Florida State Representative Shawn Harrison, called Emma Gonzalez a “skinhead lesbian.” These are adults, bullying teens who had just survived a horrific tragedy – And yet these students remained poised and focused and determined to make a difference for future generations of teens. I am inspired by how brilliantly aware of how money affects politics in the U.S. These students are focusing on the root of the gun control problem in the U.S., and holding lawmakers accountable for accepting generous donations from the National Rifle Association. In a matter of days, these students helped to organize “March For Our Lives,” the largest student-led protest in history. They are not getting caught up in a debate on whether teachers should be armed, or if metal detectors and more police are needed in schools. They are smart enough to see the real problem, even before some adults do. Some people are quick to discount these kids are just kids and they don’t know what they are talking about, but the reality is- they’ve experienced a tragedy, and they have the smarts and the bravery to do something about it, even when the adults in power choose to belittle, name-call and bully. These students make me proud to call myself a teacher and remind me that what we do every day in our classrooms has the power to transform students into fearless leaders.